This product requires the base game Awesomenauts. Aaaarrrrr, ya scurvy old sea dogs! This here be the most feared pirate of the universe! Wanted on over 500 planets for camembert plunderin', grog stealin' and sweet talkin': you'd be wise t' to hide your beauties, for leon pirate be comin'! 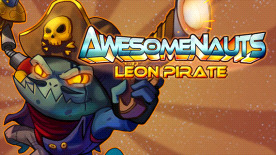 Leon Pirate comes with a fully customized voice set!